This species is widespread throughout much of Britain. It is widespread in western Europe. Globally the spider has a Holarctic Distribution: (Platnick 1998). N. cellulanus creates a small tangle-web in permanently dark, damp habitats. These habitats include mines, caves, cellars, culverts, sewers, hollow trees, amongst boulders and in thick marshland vegetation. This spider does not frequent dry subterranean habitats. Specimens can also be found beneath corrugated iron sheets (Crocker & Daws 1996). Mature specimens of both sexes have been recorded between March and November, and females throughout the year. 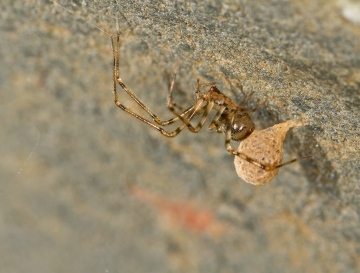 Single, spherical, translucent-yellowish egg-sacs are carried by the female, attached to her spinnerets, between June and August (Bristowe 1958). Local, but probably under-recorded due to its specialist habitat.